The question audiences should be asking is, “How did a guy from New Jersey with no Hawaiian lineage learn to play `ukulele, slack key guitar, steel guitar, and sing falsetto in the Hawaiian language?” The answer lies in Bill’s deep love of the Hawaiian people and their culture. 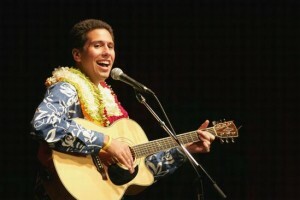 Born on October 2, 1970 in Philadelphia, Pennsylvania to a Filipino-Spanish-Lithuanian father and an English-Welsh-German-Cherokee mother, Bill Wynne came into this world as part of a family already deeply steeped in Hawaiian music and culture and into the local Hawaiian community on the East Coast where Hawaiian ex-patriots abound. Bill’s grandfather, Liborio, who could play any stringed instrument handed to him, renounced his Philippines citizenship and joined the U.S. Navy. First stop: Honolulu. Although he did not stay long, it can only be assumed that Bill’s grandfather brought his love of Hawaiian music with him to his next destinations – San Francisco, and then Philadelphia. When Liborio married and had two sons, presumably Hawaiian music was already in the home. And one of these sons – Bill’s father – fell in love with this music and learned to play steel guitar. By the time Bill came along, his parents had already been performing Hawaiian music on the East Coast for many years and, as a result, the family was favored by the local Hawaiians. Bill was instantly adopted into that very tight-knit Hawaiian community and raised in the knowledge of all wonderful Hawaiian things by the local kupuna (Hawaiian for “relatives and friends of our grandparents’ generation”). Bill recalls that “Hawaiian music was the only music played around our house. But I wasn’t much interested. My father was into the territorial era, hapa-haole music – this slow, languorous music that wasn’t quite enough to captivate the imagination of a child of the 1970s. My friends all listened to rock-and-roll. And I just wanted to fit in, so that’s what I was listening to, as well. In a sense, I guess I was rebelling against my parents.” However, Bill’s opinion of Hawaiian music slowly began to change as the local kupuna would return home from their trips to Hawai`i with stacks of the latest records for Bill. During a period of just a few years, three of those recordings changed Bill’s life forever: “Young Hawai`i Plays Old Hawai`i” by Hui `Ohana, “Sunday Manoa 3″ by Sunday Manoa, and ”No Kristo” by the Makaha Sons of Ni`ihau. “It was something about the sound – something different,” Bill says somewhat excitedly. “The beat, the instrumentation, the language – everything! It wasn’t Hawaiian music as I knew it. It was a little country, a little rock-and-roll, a little jazz, a little classical, and still a whole lot Hawaiian. That was the first time I heard slack key guitar, the first time I heard falsetto singing… I received these three records all around the same time, and I knew from the first listen that Hawaiian music was going to be a huge part of my life.” Those first few LPs started Bill on a lifelong journey into the evolution of Hawaiian music and a collecting frenzy that continues to this day. Twenty-five years later, Bill has amassed more than 2,500 Hawaiian LPs, CDs, 45s, 78s, and cassettes – more than 20,000 recordings in total. Nearly everything Bill has learned about Hawaiian music comes from the careful study of these recordings. “I learned from the best,” Bill exclaims before rattling off a long list of Hawaiian music dignitaries that includes Bill Ali`iloa Lincoln, John Pi`ilani Watkins, John Almeida, Pauline Kekahuna, Andy Cummings, Aunty Vicki Ii, Aunty Genoa Keawe, Kahauanu Lake, Eddie Kamae, Bill Kaiwa, Marlene Sai, and Sonny Chillingworth. Bill spent most of his childhood carefully examining these recordings in his headphones – trying to recreate any and every sound he heard while trying not to disturb the neighbors. At a very early age, Bill learned the `ukulele solos of Eddie Kamae and Herb Ohta note for note. He then moved on to slack key – favoring the sounds of Sonny Chillingworth and Ledward Kaapana. “I liked the sound of slack key on the electric guitar,” Bill admits. “But Sonny and Led were innovators in other respects, as well.” He stuck with the `ukulele and slack key guitar for many years before making the leap to steel guitar – as with the other instruments, beginning his study by attempting to emulate steel guitar greats like Barney Isaacs, Joe Custino, and Billy Hew Len, but quickly finding his own style. All the while, with no native Hawaiian speakers close by to teach him, Bill learned to sing hundreds of old Hawaiian songs. ”You can’t sing these songs without knowing the meaning – the full meaning” Bill admits, before quickly adding, “It is simply some of the most beautiful and expressive poetry ever written in any language. How can one attempt to sing the song with feeling if some layer of meaning remains concealed?” To that end, Bill has sought out lyrics and translations from every possible source – from the Bishop Museum’s archives to the haku mele themselves and their families. The Hawaiian tradition in which the men sing in their high falsetto register was a natural extension of Bill’s study of Hawaiian music. By the time Bill had reached his teen years, he had begun singing falsetto – and he hasn’t stopped since! And it has become his favorite aspect of Hawaiian music. “The first time I heard Dennis Pavao, Mahi Beamer, and the Brothers Cazimero, I fell in love.” It was not long before falsetto singing became Bill’s specialty. In 1994, Wynne produced – with the assistance of the local Hawaiian community – a two-day Hawaiian music festival in Philadelphia. He also began putting his musical ideas down on tape on an inexpensive four-track recorder. Even though Bill hadn’t yet made the trip to his musical “mecca,” his recordings began making the trip to Hawai`i on a regular basis in the suitcases and purses of the local Hawaiians making their annual trip home. Without Bill’s knowledge, those early demos began making their way into the hands of Bill’s musical idols – prompting recording artist and music teacher Alan Akaka to extol, “Bill has as Hawaiian a sound as any I’ve ever heard. It’s obvious he’s been doing his homework.” Then, in 1996, Bill was invited to perform as one of three opening acts for a Portrait of Hawai`i’s Music concert at Carnegie Hall – a show featuring Robi Kahakalau, Cyril Pahinui, the Makaha Sons, and the late Loyal Garner and Dennis Pavao. And, then, the unthinkable: The outsider from New Jersey entered the Aloha Festivals Falsetto Contest. He competed on O`ahu in 1993 and twice more in 1994 on O`ahu and the Big Island (taking Second Place and Third Place, respectively). He returned to the Big Island’s contest in 2005 and took Second Place yet again – and began to believe that he would forever be a “bridesmaid.” But he stuck around Honolulu for another few weeks and on September 24, 2005, on the historic stage of the Monarch Room at the Royal Hawaiian Hotel in Waikiki, singing a long forgotten song by another falsetto hero, Bill Ali`iloa Lincoln, Bill wowed the crowd – and the judges – and took home First Prize in both the Singing and Hawaiian Language categories – earning him a recording contract with the venerable Hula Records label. Bill returned to Hawai`i in July 2006 to record the CD which earned him favor among still more Hawaiian music legends who had not heard of him before. Selections from Wynne’s CD release are still available on iTunes, Rhapsody, Spotify, eMusic, and Amazon.com. Since then, Bill has visited Hawai`i a dozen times and has performed all over Hawai`i – venues as grand as the Royal Hawaiian Hotel and Halekulani Hotel and as modest and “local” as Chiko’s – fulfilling his lifelong dream of singing and playing with his Hawaiian music heroes. But none of these struck him more than his encounter with the matriarch of all Hawaiian music, Genoa Keawe. ”Singing for and with Aunty Genoa is better than Carnegie Hall any day of the week,” Wynne gushes. From that first sit-in with Aunty Genoa he forged a friendship with her that endured until her passing in 2008 and which continues with her family to this day. From those humble beginnings Wynne has fulfilled his dream of acceptance into the Hawaiian music community. “When you think about it, it was a pretty stupid dream – for a kid from New Jersey to ever perform Hawaiian music in Hawai`i for the Hawaiian people. I had a better chance of becoming an astronaut.” But Hawai`i has not only become his “home away from home” but, as he often jokes, his own real-life “Cheers” - where “everybody knows his name.” Wynne is recognized everywhere and called upon to join the show – “Hawaiian style” – wherever he goes. And that is better than he ever dreamed it could be.